Johannesburg, South Africa, 7th February 2012 – Nikon in South Africa today announces a groundbreaking new 36.3 megapixel FX-format professional D-SLR, the Nikon D800. 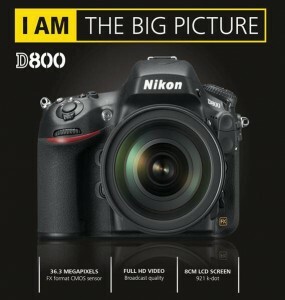 In an industry first, this exciting launch includes a special edition of the D800 – the Nikon D800E. With a modified optical filter, the D800E offers a unique alternative for those seeking the ultimate in definition. The groundbreaking 36.3 megapixel FX-format (full-frame) CMOS sensor incorporates key technology that enables unprecedented levels of detail and tonal range. 12-channel readout with 14-bit A/D conversion and high signal-to-noise ratio: delivers images of remarkable quality with low noise and wide dynamic range. Broad ISO: offering an ISO range of 100–6400, extendable up to 25600 (equivalent) and down to 50 (equivalent), the D800 will set a new benchmark for D-SLRs with this level of resolution. The camera’s intelligent noise reduction systems manage noise without sacrificing fine details, allowing superb flexibility under all lighting conditions: images are crisp and clean, even at higher ISO settings. Equipped with Nikon’s next-generation EXPEED 3 image-processing engine, the D800 makes light work of data-rich tasks without sacrificing the speed and quality that pros are accustomed to. 16-bit image processing: offering richer colours and tones than ever before, this cutting-edge image processor delivers smooth gradations with abundant detail and tone all the way up the scale to pure white, even when shooting in JPEG. For professionals whose workflow demands video, the D800 offers all the flexibility required for a wide variety of movie applications. It’s large format movie shooting at its best, with a comprehensive variety of frame rates. Frame rates: Full HD (1080p) movies can be recorded in 30p, 25p and 24p, with 60p, 50p and 25p options at 720p. Movie clips can be up to 29:59 minutes long. Multi-Format Full HD D-Movie: as introduced with the D4, Full HD recording is possible in both FX and DX based formats, enabling exceptional freedom of expression. High-fidelity audio control: responding to feedback from the industry, the D800 sets a new standard for D-SLR audio recording, enabling your movies to sound as good as they look. Aside from the external stereo microphone input, an audio out for external headphones lets you fine tune audio in isolation, both before and during movie recording. A line input setting for PCM linear recorders is also provided. Uncompressed HDMI output: for those who need the purest video output for professional quality editing, the D800 offers the possibility to output the uncompressed live view to external recorders and monitors. As with the Nikon D4, this data is output at the designated image size and frame rate, and is clean of the information overlay that can be simultaneously displayed on the camera’s TFT monitor. Convenient custom controls: have been implemented for live view operation. Instead of rotating the command dial, power aperture enables smoother aperture control using assigned buttons on the front of the camera. Index marking helps you tag important frames in the timeline by attaching markers during movie recording, which makes for easy location during editing. Nikon’s revolutionary Advanced Scene Recognition System now incorporates a newly designed 91,000-pixel RGB sensor that meticulously analyses each scene for outstanding accuracy. It can detect human faces with startling exactness even with exclusive use of the optical viewfinder, and recognize a scene’s colours and brightness with unprecedented precision. This level of detailed scene analysis is also utilized to support more accurate autofocus; auto exposure and i-TTL flash exposure results in a diverse range of compositional and lighting situations. For example, 3D-subject tracking is particularly improved when shooting smaller subjects. Implementing Nikon’s highly-acclaimed Multi-CAM 3500FX AF system — with individually selectable or configurable 9-, 21- and 51-point coverage settings — the autofocus sensor module and algorithms have been re-engineered to significantly improve low light acquisition sensitivity capabilities down to -2 EV (ISO 100, 20°C/68°F). The overall performance is similar to the latest flagship of Nikon, the D4: AF operation is even possible under a combined aperture value of f8 (e.g. a 600mm f/4 AF-S lens combined with 2x-teleconverter TC-20EIII) with 11 AF sensor involved, and with 15 AF sensors between f/5.6 and f/8. Simplified AF and AF-area mode selection is now possible without taking your eye away from the viewfinder. The Nikon D800 responds as quickly as you do, with secure, conveniently placed, buttons and controls that quickly become an extension of your hand. Fast response: start-up is approx. 0.12 seconds1, release time lag is minimized to approx. 0.042 seconds2 (equivalent to that of the D4), with continuous approx. 4 fps capability in FX-format and crop modes, pushed to approx. 6 fps capability in DX-format Crop mode with the optional Multi-Power Battery Pack MB-D12. Precision 8-cm (3.2-in. ), approx. 921k-dot, wide-viewing-angle LCD monitor with automatic monitor brightness control: delivers bright, crisp image playback with a much wider colour reproduction capacity. LCD brightness is automatically adjusted according to the viewing environment and images can be magnified up to 46x during playback, which can be a big help for spot focus confirmation. Glass prism optical viewfinder with approximately 100% frame coverage and 0.7x magnification (50mm f/1.4 lens at infinity, -1.0m-1). Dual-axis electronic virtual horizon offers accurate confirmation of level shooting by letting you check the LCD monitor, or the viewfinder, for both the camera’s position in relation to the horizontal plane and its pitch (forward or rear rotation). Enhanced ergonomics: buttons and dials have been strategically laid out for fluid operation. Improvements around the shutter-release button mean your index finger can rest comfortably for longer periods of time, while the designated movie record button means you’re ready to trigger movie shooting in an instant. Build features high-quality rubber materials for secure grip. Release mode dial: mode visibility and operability has been improved via a four-button layout and release mode dial on camera’s top deck, along with dedicated buttons for ISO, White Balance and Image Quality. A new bracketing button has been strategically placed to aid such features as HDR. Direct access to Picture Controls via a new, dedicated button, rather than via the menu. Picture Controls let you customize the look of your stills and videos by fine-tuning parameters such as sharpness, saturation, and hue. Despite its light weight and compact size, the D800 is as tough as Nikon’s professional single digit cameras, with extensive weather and dust sealing throughout to ensure you can keep working when the going gets tough. High-precision, high-durability shutter: the shutter unit has been tested to well over 200,000 cycles of release to prove durability and precision. Boasts a speed range of 1/8000 to 30s; features an intelligent self-diagnostic shutter monitor and, for the first time, a drive unit designed to reduce the demand on power when the shutter is raised for extended periods during movie shooting. Efficient power management: a re-working of the D800’s circuits now enables approx. 850 shots3 of still image shooting or approx. 60 min. of movie live view4. All on one charge of a Rechargeable Li-ion Battery EN-EL15. Build quality: as reliable on the road as it is in the studio, the D800 boasts a weather- and dust-sealed magnesium alloy body that weighs in at approx. 10% lighter than the D700. Storage media: high-speed CF (UDMA 7) and SD (SDXC and UHS-1) dual card slots. High-speed data transfer with USB 3.0. The Nikon D800E is a special edition of the D800, specifically designed for those seeking absolute definition. Incorporating an optical filter with anti-aliasing properties removed in order to facilitate the sharpest images possible, this is an ideal tool for photographers who can control light, distance and their subject to the degree where they can mitigate the increased risk of moiré5 and false colour. Aside from the optical filter, all functions and features are the same as on the D800. The D800 incorporates a variety of creative and practical tools for those too busy to spend time in excessive post-production. Time-lapse movies: the D800 extends the popular time-lapse photography function by saving images as a movie file in the camera. With playback rates from 24 to 36,000 times faster than normal. HDR (High Dynamic Range) shoots one overexposed and one underexposed frame in a single shutter release. The range can be widened by up to 3 EV for different looks, full of saturation and tonal gradation, while the smoothness of the edge where the two exposures meet can be adjusted for a more natural appearance. Refined colour temperature control enables minute control over white balance. The monitor hue of live view and the resulting image’s white balance can be adjusted so that the two are aligned. Colour temperature can be manually set in 10-Kelvin increments, or in mired units. Auto shutter speed control for auto ISO sensitivity control: a new auto option for minimum shutter speed, which automatically controls the balance between shutter speed and ISO sensitivity based on the focal length of the lens being used. Four image area options: for the first time in a camera of this class, you can choose from a variety of image crop modes, all visually masked in the viewfinder. 5:4 (30.0 x 24.0 mm), 1.2x (30.0 x 19.9 mm), and DX-format (23.4 x 15.6 mm). In-camera editing: captured images and movies can be altered and edited in camera and on the fly if required. Retouch menus include an array of useful features such as NEF (RAW) processing, resize, distortion control, fisheye, miniature effect, red-eye correction, filter effects and image overlay — as well as the ability to designate the start and end point of movie clips all at once, in order to save them more efficiently. Multi-Power Battery Pack MB-D12 (optional) accommodates a variety of batteries (see specifications) and utilizes the same integral magnesium alloy construction and weather sealing as the D800 body itself. You also get approx. 6 fps continuous shooting speed6 in DX-format. The MB-D12 has its own dedicated shutter-release button and command dials for vertical composition shooting. Nikon SB-910 (optional) — unparalleled lighting performance: Nikon’s SB-910 offers versatile i-TTL for on-camera or wireless flash control, refined operability and a powerful guide number of 34/112 (ISO 100, m/ft, STD, FX format, zoom 35mm). Menus and controls have been improved for more operational ease. Hard-type incandescent and fluorescent colour filters are included, which can adjust your D800‘s white balance instantly. Capture NX 2 (optional) — Fast, powerful and creative image processing: to accommodate the imaging power of the D800’s 36.3 effective megapixels, the latest Capture NX 2 is faster than before and 64-bit compatible7. Camera Control Pro 2 (optional) — Versatile remote camera controls: aside from controlling exposure mode, shutter speed, and aperture, the software now offers numerous improvements to make the D800’s live view operation exceptionally smooth. New creative controls include remote start and stop for movie shooting and switching between live view for stills and movies. ViewNX 2 (supplied) — Browse, edit, share and more: this bundled, all-in-one software implements an easy-to-use interface and an array of editing functions, including basic editing of RAW files and D-Movies. Seamlessly integrates with my Picturetown, Nikon’s photo sharing and storage service. 5. The D800E carries and increased possibility of moiré and false colour compared to the D800. This can be minimised for RAW shooters in post with the Moiré Reduction tools available in Capture NX2. 7. The D800E carries and increased possibility of moiré and false colour compared to the D800. This can be minimised for RAW shooters in post with the Moiré Reduction tools available in Capture NX2. Now that the D800 is official, what is the RRP in South Africa, based on Nikon’s new international pricing policy?